Junior to mid-grade leaders, both officers and NCOs, do a lot of thinking! These leaders constantly develop innovative solutions for problems, ranging from the simple to extremely complex, during combat deployments, training exercises, and garrison activities. These solutions or ideas are worth hearing about, however many of these young leaders remain professionally silent. Published articles by this demographic of Army leaders are extremely important to their personal development and to our profession, but are also extremely rare. It’s not that these leaders necessarily have better ideas than the Command Sergeants Major, Colonels, or General Officers, it’s simply that they bring a fresh outlook to the professional discourse that takes place in our military journals and other outlets. To further illustrate this point, think about when you PCS. If you’re anything like me, after living in a new house for only a month, I no longer notice those things that bothered me when I first moved in. It usually takes someone who doesn’t live with me, to bring them back to my attention. Similarly, NCOs and officers that have been in the service for a decade or more may have become blind to those blemishes and annoyances that still are fresh in the eyes of younger leaders. It is this voice we need to continue to hear through publication in printed journals and online blogs. A desire by younger men and women in the Army to improve themselves, and in the process their craft, is nothing new. Take for example two innovative officers in the Interwar Period. 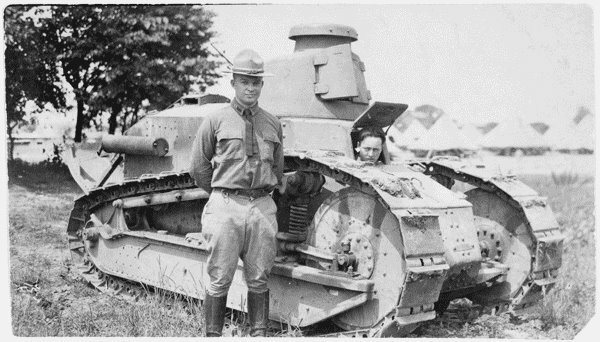 In the fall of 1919, Major Dwight Eisenhower and Lieutenant Colonel George Patton began spending a considerable amount of time training, experimenting, and discussing new methods of tank warfare at Camp Meade. They saw the possibility of using tanks to achieve rapid breakthroughs vice just moving in support of the infantry. Eisenhower captured these ideas in writing and published them in a 1920 Infantry Journal article, titled “A Tank Discussion”. The article wasn’t well received because it ran counter to the accepted doctrine. Eisenhower was reprimanded by the Chief of Infantry, MG Charles S. Farnsworth, who told him that his ideas were dangerous, and that if he tried to publish them again he would face a court-martial. At the time of publication, Eisenhower had only five years of experience and the tank was still a nascent technology on the battlefield. He wasn’t overly invested in the tactical doctrine, so his creativity wasn’t stifled. He faced some pressure for publishing his thoughts, but in the end it contributed to a professional discussion that eventually led to better doctrine for the inclusion of armor in the fight. Today’s younger officers and NCOs have more battlefield experience, and more practice at creating innovative solutions to combat situations, than most recent generations. Unfortunately, their new perspectives and ways of doing business are largely kept at the unit level or shared among groups of friends. They are thinking, and hopefully writing, but too few are publishing. This is something that we must change. In the words of Admiral (ret) Jim Stravridis, “publishing your thoughts for others to see…. extends the reach of your ideas and sparks a larger discussion, a larger professional conversation.” Following a decade of lessons learned in and out of combat, we need this larger conversation to occur so that the profession may continue to evolve and adapt. A few years ago, I decided to move beyond thinking into writing and publishing. In 2011, I came out of my second command and, for the first time in eight years, had a considerable amount of time for reflection. I whipped out a green notebook and began to write, and write, and write some more. While this was great for me personally, it wasn’t that valuable to the profession. After reading the blogs and articles from current leaders like Jonathan Silk, Nathan Finney, and Benjamin Kohlmann, I decided to compile my notebook scribbles into substance for publication. One of the first articles I wrote took me 4 months, numerous drafts, and constant sharing with friends and mentors for comments. I remember being excited and anxious as I finally submitted it for publication to Military Review. It only took a few weeks to receive a rejection notice. While I was disappointed, I had an idea that was no longer simply in my head, it had crystallized in written form. I passed it around and a couple of things happened: First, I was offered a temporary assignment to work on a project that was related to the article. I got to see a concept that I wrote about come to life, thus giving me a chance to affect the greater profession. Second, a higher-ranking officer reached out to me and combined pieces of my rejected article with his research to produce a piece that was published in the May-June 2013 issue of Military Review. Those events validated for me the point that if junior leaders want to affect change, make the profession better, or just share experiences with others, we need to step onto the battlefield of ideas with our thoughts captured in writing. 1.) Multiple drafts/Multiple sets of eyes– None of my articles/posts have ever been ready for publication after the first, second, or even the third draft. There are always grammatical errors or structural problems that I might miss, so I pass it along to a friend for review. After finalizing the edits, I may pass it on to one more person for a final look. One more set of eyes never hurts. 2.) Seek out mentors to develop articles– In addition to potentially coauthoring articles, mentors can provide additional insight, offer a more seasoned perspective, and provide additional resources to bolster the article. 3.) Be prepared for feedback- To paraphrase Stravridis, publishing articles is like nailing your whispers to the wall for everyone to see. Not everyone is going to agree with your viewpoints, but that is okay. Negative feedback is nerve-racking and scary; however it lets you know that people are at least reading your efforts. Hearing from or reading comments from others who disagree with your viewpoints offers you the opportunity to see differing outlooks on the subject, which may help to deepen your understanding of the subject you wrote about. 5.) Writing opens doors- Eisenhower’s article in Infantry Journal may have closed some doors within the Infantry Branch, but it also may have served as a building block in his relationship with Fox Conner. One of Conner’s own articles, published 10 years earlier, “Field Artillery in Cooperation with Other Arms,” led to revisions in artillery doctrine. Without Fox Connor’s mentorship of Eisenhower, much of the military history of the mid-twentieth century would be quite different. As in the past, today there are senior leaders in the Army that will champion initiatives…but they need to read about them first. 6.) There’s a venue for everyone – From online military blogs like Small Wars Journal and War on the Rocks, to branch magazines like Armor and Infantry Magazine, there is a venue for every leader at every level. Chances are there is at least one that would be interested in your (well-written) idea. In less than a week, I will take the next step in my professional career, moving from company grade to field grade officer. While I hope that my views will always remain current and relevant, I know that over time I may become blind to those things that can and should be changed. One way to avoid this blindness is to continue to read published articles of company grade officers and NCOs, as well as working with those interested in writing. The next crop of Pattons and Eisenhowers are currently walking among us, and I would love to read their thoughts. Keep reading, keep thinking, keep writing. Got it. Great post. Something I often complained of was that NCOs seldom put down their thoughts and experiences and wrote. I am glad to see a resurgence in thoughtful introspection and Noncoms are well represented. Keep the fire to write, it is important now and in the future. Great article that outlines very well why NCOs and junior officers should pursue publication and enter the “battlefield of ideas.” Your recommendations on preparing articles for submission are spot on. Another tactic I’ve used, that really helped me craft a good article (it won an award), was to seek opposing ideas. While working on that article, I was given a college comunications project to make a presentation with a partner. Our presentation became a point/counter-point on the idea I was writing about in my article. Preparing the presentation provided me the opportunity to hear and consider counter-arguments to my thesis. It also allowed me to discuss those counter-arguments in the article. Doing so allowed me to ‘battle’ potential dissenters in advance and take the discussion a step further without engaging in as much post-publication discussion. In short, seeking counter-arguments to your own ideas not only helps you consider opposing views, it leads to a better, more fully-developed article. Again, this is a great post and definitely good advice for anyone considering giving their ideas a wider audience. And also good for those senior folks who might read those ideas. Thank you for this post. It is really stoking me to continue writing on my profession as I head into the career course. I’ve written a little on military and professional ethics before, and you’ve motivated me to start up again. Many reasons to write. Sharing your viewpoint matters. The process of making a cogent and well organized article teaches you by refinement. What you may have thought at the outset may alter through the process, so you’re enlightened. People may not stand and clap, or even utter a comment. It doesn’t matter. That’s not why you write.